The research of several of our faculty focuses on the development and optimization of magnetic resonance imaging techniques. These efforts draw on a variety of physics and engineering principles, with a strong emphasis on theoretical modeling and simulation, and on practical implementation and evaluations. Focus: Imaging and spectroscopy of the human lung using hyperpolarized helium- and xenon-based methods, and high-resolution 3-D imaging using conventional proton-based methods. Hyperpolarized helium and xenon are new MR-based gaseous contrast agents that are particularly well suited for imaging air spaces such as those of the lung. Hyperpolarized-gas MR provides high-resolution, detailed images of the lung that are far superior in quality to those from any existing clinical imaging method, and offers a variety of approaches for obtaining unique functional information about the lung. Research on high-resolution 3-D imaging aims to increase spatial resolution, decrease acquisition time, and improve image quality for methods applicable to routine clinical imaging throughout the human body. Focus: Early detection and characterization of disease using novel techniques, as well as on minimally invasive treatments for cancer. Most of our work has been done towards techniques that are primarily applicable to the lung and brain. Current research projects include: Regional Quantification of Lung Function in Cystic Fibrosis and Lung Cancer using Xe129 MRI; Non-invasive Cytoreductive Surgical Treatment of Lung Cancer and of Pleural Mesothelioma; Non-invasive Targeted Delivery and In-vivo Evaluation of Brain Therapy using MR guided Focused Ultrasound; Brain infusion using Convection Enhanced Delivery (CED). Focus: Developing new pulse-sequence techniques, contrast mechanisms, and hardware for magnetic resonance (MR) imaging of the lung and MR-guided focused ultrasound of the brain. Focus: Hyperpolarized noble-gas magnetic resonance imaging to study lung function and lung disease, optimization of MR pulse sequences, and lipid quantification in the liver using MR imaging. Focus: Developing MRI techniques for assessing the structure, function, and perfusion of the cardiovascular system, particularly in the setting of cardiovascular disease. 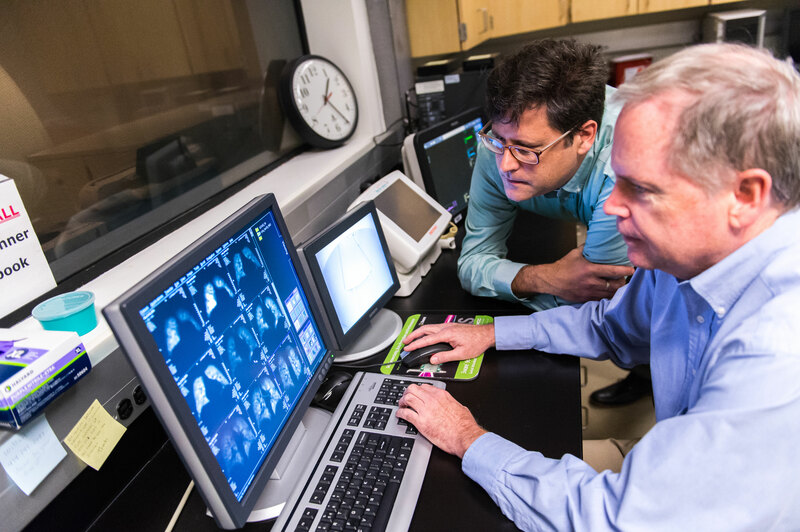 While the focus of this lab is on imaging in cardiovascular disease, researchers are also involved in imaging related to diabetes and musculoskeletal disorders. Recent projects have included the development of displacement-encoded MRI for quantifying tissue motion, first-pass contrast-enhanced MRI and arterial spin labeling for imaging myocardial perfusion, molecular and cellular imaging of collagen and macrophages in myocardial infarction, and manganese-enhanced imaging of pancreatic beta cells. Through collaborations with radiologists, cardiologists, endocrinologists, molecular biologists, and mechanical and electrical engineers, the novel MRI methods developed by this group are applied in both clinical and basic medical research. Focus: Developing new MRI techniques, especially techniques that acquire the image data very rapidly. This work involves MRI physics, signal processing, and image reconstruction techniques. Rapid MRI acquisition is particularly important for cardiac studies, because of cardiac and respiratory motion. One technique being studies is real-time interactive imaging, which allows images of the beating heart to be acquired, displayed and controlled in real-time. This technique allows rapid evaluation of cardiac function and rapid scout scans of the coronary arteries. Work is currently underway to enhance the image frame rate and resolution using new image reconstruction methods implemented on dedicated high-performance Linux clusters. In addition to real-time imaging, these techniques are used to generate high-resolution images of the coronary arteries within a breath-hold. High-resolution images are applied to noninvasive coronary angiography and coronary vessel wall imaging. Researchers in this lab also actively collaborate with other labs at UVa on a variety of projects. One such collaboration is focused on developing new contrast agents and imaging methods for targeted molecular imaging of vulnerable atherosclerotic plaque, which has as its long-term goal preventing cardiovascular events. Another collaboration is focused on developing image-based models of musculoskeletal disease. Peripheral arterial disease is being studies through a set of MRI methods and the development of new methods of characterizing heart failure. In collaboration with the active hyperpolarized gas imaging group, fast methods of imaging the lung are also being developed.